In the beginning the Anglo-American Allied proposed to file a single massive criminal lawsuit against the main German military commanders guilty of violence against civilians. As a matter of fact in the first post-war years the Allied military courts brought to trial some high Nazi officials, among others Eberhart von Mackensen and Kurt Mälzer in Rome in 1946 (initially sentenced to death than commuted), Albert Kesselring in Venice in 1947 (initially sentenced to death than commuted), Max Simon (initially sentenced to death than commuted), Edward Peter Crasemann (10 year jail sentence) and Willy Tensfeld (acquitted) in Padua in 1947. At the same time a British military court committed General Nicola Bellomo (Bari 1945) to trial and an American military court committed to trial General Anton Dostler (Caserta 1945), both charged with war crimes against Allied prisoners and sentenced to death (both executed). 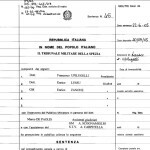 From 1948 on other proceedings were managed by Italian military courts. Totally the criminal trials leading to a sentence were only thirteen, all of them between the end of the Forties and the beginning of the Fifties; the charges related to major massacres included: the Fosse Ardeatine massacre in the trial to lieutenant-colonel Herbert Kappler; the massacres of Monte Sole, Bardine San Terenzo, Valla and Vinca in the trial to Major Walter Reder; the massacres of Stia, Vallucciole and Civitella della Chiana in the trial to lieutenant-general Wilhelm Schmalz; the massacre of Padule di Fucecchio in the trial to Major Josef Strauch. tThe first round of trials was characterized by: frequent acquittals, inappropriate ludicrous sentences completely unsuitable for the gravity of the committed crimes, the wide acknowledgment of extenuating circumstances for having obeyed to orders from the top, sentence reductions and remissions. At the beginning of the Fifties there were only two German defendants serving a life imprisonment sentence: lieutenant-colonel Herbert Kappler and Major Walter Reder. Even considering the 18 criminal lawsuits ended in the preliminary phase, mostly in the Fifties, the total number of trials for war crimes in the Fifties was incredibly low. Some Italian military courts in the mid-Nineties initiated a second and more substantial round of trials. These trials were due to the discovery in Rome at Palazzo Cesi, the headquarters of the military prosecutor’s office, during the inquiry conducted in 1994 for the trial against SS Captain Erich Priebke, of 695 inquiry files on Nazi and fascist war crimes perpetrated in Italy during the Second World War and which had been unduly dismissed in 1960 by an order of the military public prosecutor Enrico Santacroce (whose behaviour was later investigated in 1996 by an Inquiry Commission of the Council of military magistrates and also in 2003 by a Parliamentary Commission of Inquiry). The public prosecutor’s offices of the territorial military courts of Turin, Padua, La Spezia, Verona, Rome and Naples had to manage dozens of new preliminary inquiries. The criminal proceedings leading to trials between 1994 and 2003 were 5, including the trial against lieutenant-colonel Sigfried Engel for the Benedicta and Turchino massacre and the trial against SS Captain Theo Saevecke for the massacre of Piazzale Loreto in Milan, both ended with a sentence to life imprisonment. Another 17 lawsuits with German defendants charged with massacres, including those of San Cesario sul Panaro, Certosa di Farneta, Sant’Anna di Stazzema, Civitella Val di Chiana, Barzolino and San Tomè, Monte Sole, San Terenzo and Vinca, Casalecchio di Reno, Padule di Fucecchio, Stia, Vallucciole and Mommio, Monchio, Susano and Costrignano, Civago and Cervarolo, Borgo Ticino, Fragheto and Cefalonia, became final between 2004 and 2014 leading to several sentences to life imprisonment. The real protagonists of this second round of trials were not the German defendants, mostly contumacious and not extradited to serve their sentence, but the victims and their relatives, who, more than sixty years after the events, had to retrace in a judiciary context the violence suffered and its impact on their lives, trying to “quantify” the entity of their trauma over time and assess it in material, physical and emotional terms.